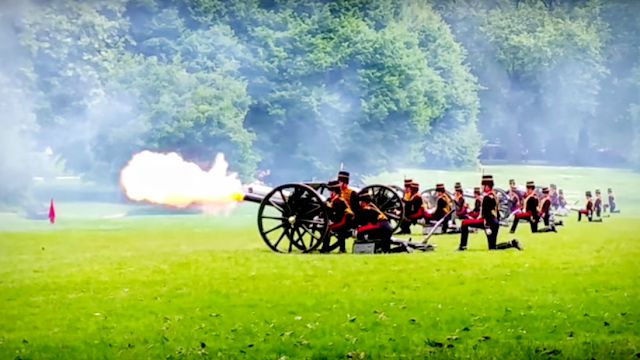 Gun salutes began as a naval tradition, whereby a warship would fire its cannon out to sea until all ammunition was expelled, thus showing that there was no hostile intent. As the years passed naval customs changed, until a 21-gun salute became the standard. Even then this was only reserved for the Head of State, with Salutes then decreasing in number, depending on the rank of the recipient. In London, the King's Troop Royal Horse Artillery fire the salutes from Hyde Park, Green Park and Horse Guards Parade. Although the basic salute is 21 rounds, at ten second intervals, if it takes place in a royal park a further 20 rounds are added. The first round is fired at noon. Salutes fired from the Tower of London are made by the Honourable Artillery Company, using four twenty-five pounder guns. However, as the Tower of London is a royal palace, an extra 20 rounds are fired. Then an additional 21 rounds are added for the City of London, making 62 rounds. The first round is fired at 13:00.